Our columnist believes an early, structured focus on style, position and effective riding could benefit young eventers. I’ve found that any discussion of the term “equitation” tends to create polar opposites of opinion. Advocates of creating a structure in which young riders are judged on style, position and effectiveness will argue that correct basics, instilled early, will lead to a lifetime of more effective riding. They point out how many of the U.S. Equestrian Team’s superstars have gotten their start in the equitation ranks, and they claim that correct form leads to effective function. Although both viewpoints have validity, I suggest that U.S. eventing might want to consider creating some type of equitation class for eventers, similar to those already in place for young riders in the hunter/jumper ranks. There are three distinct “seats” that top eventers have mastered—the dressage seat, the cross-country seat and the show jumping seat—and they are quite different from one another. Any equitation program should address at least the dressage seat and the show jumping seat. It’s probably too difficult logistically to address cross-country jumping. I think it’s “broke” in the respect that if we accept the premise that good form does correlate with better function, many eventers don’t ride with classic form and effectiveness. If you go to any event and really study the riders, there will be plenty of lovely, balanced and secure performances by riders who are centered over the motion and whose horses are in control, rather than running flat and out of balance at the jumps. But there will also be large numbers of riders who exhibit lots of faulty basics. Many ride with stirrups that are too long, with an insecure and swinging lower leg. Some look down, throw their bodies up the neck, allow their horses to run too fast and too flat at the jumps, miss their distances to the take-off point—the usual litany of jumping woes. In an arena, on flat terrain, over jumps that knock down if hit, most of this is only penalized by loss of points. However, eventers don’t stay on flat footing in an arena over jumps that fall down if they get hit. There are at least five differences between cross-country jumping and show ring jumping, and it’s on cross-country that the lack of good basics has the potential to be lethally unsafe. First, the speeds are faster. Second, the higher speeds and the open terrain cause many horses to become more aggressive. Third, there are usually hills, creating both uphill and downhill approaches. Fourth, there is greater likelihood of fatigue of both horse and rider. Fifth, all this takes place over solid obstacles. So now we have the worst-case scenario. A rider with a loose position and a tendency to jump ahead of the motion comes flying down a hill toward a solid obstacle on a horse that is flat and strung out because of fatigue or aggression. When you watch this, as I do, weekend after weekend, you realize that something needs to get fixed. Correct basics need to be installed, and the earlier in a rider’s career the better. 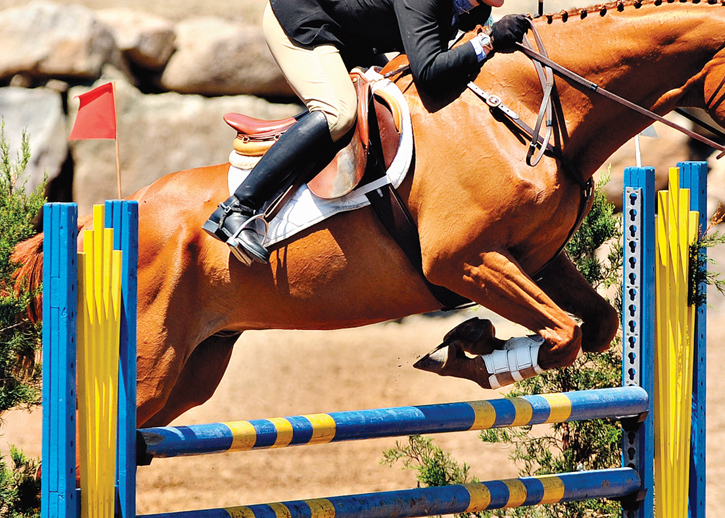 Although show jumping is also an objectively scored sport, and, theoretically, style doesn’t count, there’s often a big difference between the conduit used in America to produce show jump riders and event riders. Current eventers, with few exceptions, have come into eventing by riding at very low-level events and working up from there. In earlier days, riders also came into eventing through foxhunting and Pony Club, and some, no doubt, still do. Generally, most of these riders will not have been judged on form and effectiveness. But many of America’s best show jumping riders and trainers rode in the AHSA Medal, the ASPCA Maclay, various USET equitation classes and the WIHS Classic, and in every case, they were judged on style, position and effective riding skills. The names of some of these winners and “top-10” finishers read like a “Who’s Who” of international riding: William Steinkraus, Frank Chapot, Ronnie Mutch, Victor Hugo-Vidal, George Morris, Michael Page, J. Michael Plumb, Katie Monahan, Conrad Holmfeld, Chrystine Jones, James Kohn, Bernie Traurig, Mary Mairs, James Hulick, Joy Slater, Anna Jane White, Ellen Raidt, Buddy Brown, Charlie Weaver, Leslie Burr, Robin Rost, Katherine Burdsall, Francie Steinwedell, Mark Leone, Lisa Tarnopol, Peter Wylde, Chris Kappler, Aaron Vale, Scott Hofstetter, Richard Spooner, Molly Ashe, Ray Texel, McLain Ward, Lauren Hough, Meredith Michaels, Alison Firestone, Marley Goodman, Kent Farrington—the list goes on and on. We don’t know for sure whether the later success of the young riders who won those Medal/Maclay ribbons was largely the result of learning correct basics early, because it’s also likely that those successful youngsters were the ones with the most drive, talent and initiative to begin with. Still, this correlation between an early emphasis on classic horsemanship and later success in the “big divisions” can’t possibly be a coincidence. The evidence seems overwhelming that “equitation” did not create riders who were “pretty” but ineffective, rather, those Medal/Maclay competitions produced some of the greatest riders in the world. In all those names, only Michael Page and J. Michael Plumb, however, went on to gain international status in eventing. If eventing is going to create a pool of young riders steeped in the precepts of classic equitation, then eventing needs to develop its own programs to instill the requisite skills. Jack Le Goff used to preach that the three things a good rider must have were: 1. A good seat. 2. A good seat. 3. A good seat. So we should take away their stirrups and see if they bounce! We should see if they have tall, open and soft dressage posture, quiet and effective use of hands and legs. Then we should test them over a course of show jumps, up to about 3’6″, including some sophisticated turns and lines, and a double and a triple combination. They should be judged on posture, the “Bill Steinkraus Lookalike Contest,” aiming for heels down, leg secure, hip and knee angles closed, chin up, arms softly allowing. They should find their distances, get their changes and be effective as well as stylish. They should absolutely be able to rate their horses, to lengthen and shorten the stride, and be secure and balanced. We need some system to help create safer riding, and we also want our top riders to be competitive in that big, tough world out there, full of Germans, Brits, Aussies, Frenchmen, Kiwis and Canadians, all intent on keeping us off the victory podium. Equitation classes have surely contributed to the success of our show jumping counterparts. Many of those former Medal/Maclay stars have anchored USET show jumping squads for decades. Do they know something that American eventers haven’t yet figured out? Could the same kind of system help U.S. eventing? At the very least, creating an equitation division in eventing ought to be a topic of discussion. 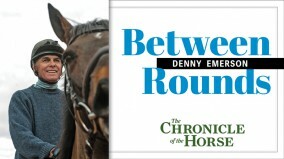 Denny Emerson rode on the 1974 World Championship gold-medal eventing team. He served as the U.S. Eventing Association president twice and won the USEA Wofford Cup for his lifetime dedication to eventing. At his Tamarack Hill Farm in South Strafford, Vt., and Southern Pines, N.C., he trains horses and riders and stands stallions. An original Between Rounds contributor, Emerson began writing his column in 1989. If you enjoyed this article and would like to read more like it, consider subscribing. “Eventing Equitation: Would It Work?” ran in the May 9, 2011 issue. Check out the table of contents to see what great stories are in the magazine this week.